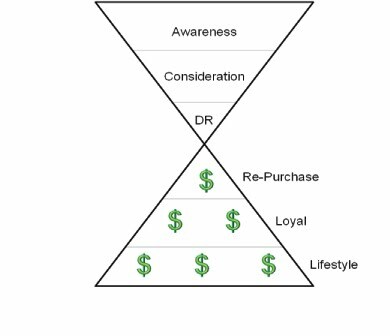 It's Not A Purchase Funnel Anymore People! More and more marketers want to know how to really focus their dollars into smart ROI programs. In order to do so, you really need to focus beyond just the first or one-time purchaser. 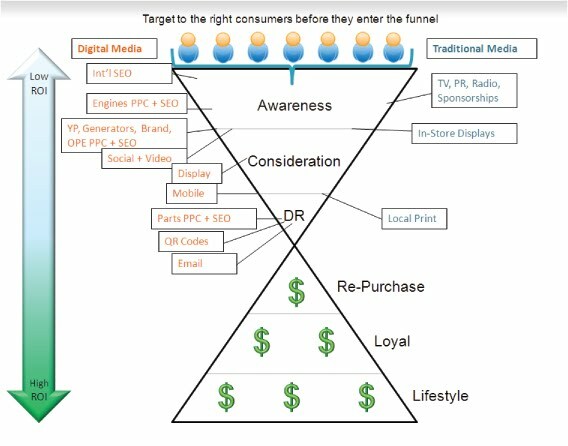 Digital marketing allows you to track and optimize for a re-purchaser or a loyal customer: someone who has a lifestyle buying behavior. 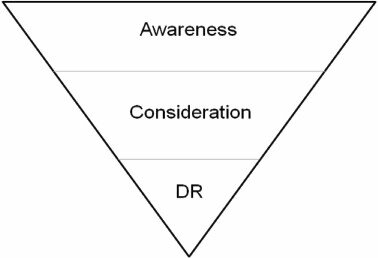 Trackable marketing dollars are typically focused on the top half of the hourglass and more specifically, for search, in the DR (Direct Response or Purchase) portion of the pyramid. This is a bad move, especially if you want your brand to resonate in an increasingly saturated marketplace. Now, take this one step further. You need to layer in the consumer. Who are you targeting? Who do you even want them to enter the buying hourglass? 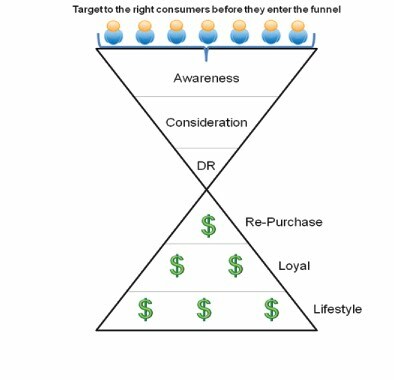 Targeting the right consumers before they enter the buying hourglass will allow you as marketers to use your dollars more efficiently. Researching and building out a digital profile will further endorse your marketing strategy and refine your program. Rather than casting a wide net and hoping for the best, you are now bait fishing via your targeted messaging, creative and landing pages. So, how do you do this? You layer in various aspects of Digital and Traditional marketing to your overall marketing program. 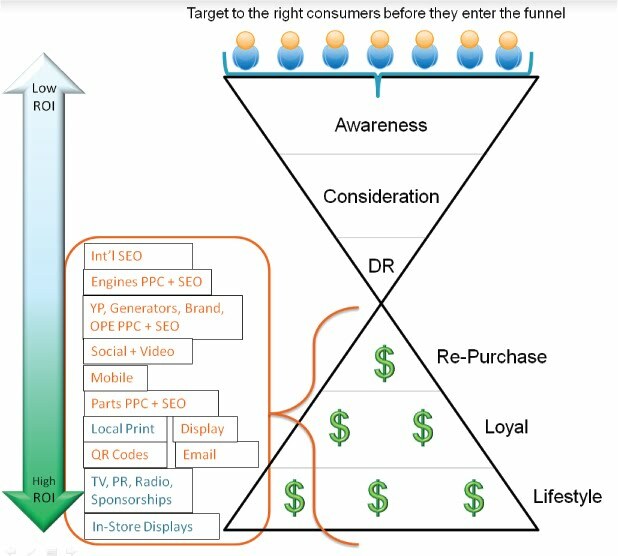 Following is where I would place the different platforms you can use on the purchase funnel. Once a consumer is aware of your brand, considers your brand, purchases your brand, they don’t stop consuming media. They will continue to be exposed and reminded of your brand through your marketing programs and you will just have gained more mindshare. To use an analogy, it is like when my husband and I were thinking about purchasing a car. We first thought, what type of car do we want? Coupe, sedan, SUV, etc? With our daughter and the village we have to pack every time we travel with her, we decided on an SUV. Once we determined that, we narrowed our choice to three brands and then to two brands. Once we were trying to decide on which brand to chose, we started noticing both brands everywhere we went. This is consideration. We eventually narrowed it down to the brand we bought, but had to chose the dealer. After we purchased our car, we noticed our car even more, everywhere we went, in media, etc. This is mindshare. Even though we made the purchase, the marketing is all around us, reminding us of our car…not to mention the friendly fliers from our dealer. 1. 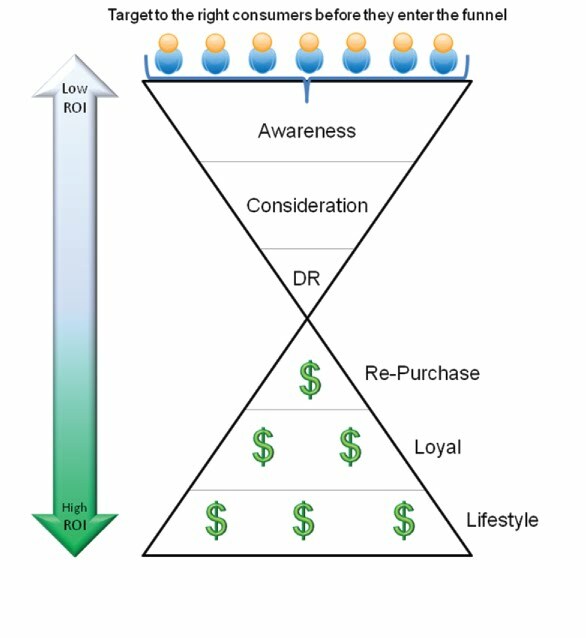 It is not a purchase funnel! It is an hourglass. 2. Be smart. Target your dollars to work further for you. Focus on the consumers that have the highest propensity to go through the hourglass. 3. 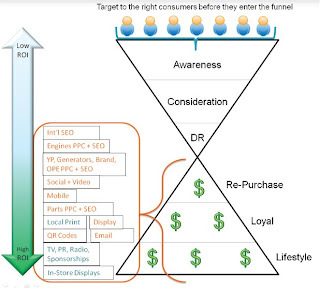 Don’t focus on the 1:1 return, but think long term to maximize ROI. 4. Have a good Digital and overall marketing strategy and marketing mix.